Do you have enough coverage for the family boat? 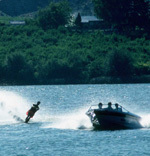 Or do you have something smaller and faster, such as a Jet Ski®, Wave Runner® or Sea Doo®? Coverage under your homeowner's policy is generally limited and insufficient to meet a potential loss or liability you may experience during the boating season. We have plans that can provide INCREASED COVERAGE, and we would be happy to review your options with you. Make sure your summer boating fun isn't spoiled by an unexpected loss! We represent a major specialty insurance carrier that can meet all of your boat insurance needs!